NEWLY-RENOVATED! 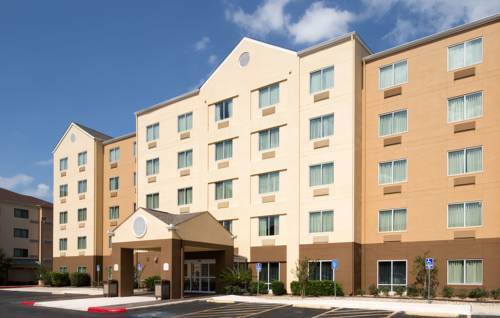 Located less than 2 miles from SAT Airport and steps from North Star Mall, Fairfield Inn San Antonio Airport hotel has completed a renovation! Weve revamped our rooms with all new furnishings. A top choice among hotels near San Antonio Airport, we offer free perks including onsite parking, property-wide WiFi and even a free hot breakfast each morning. We even have a free shuttle to the airport and nearby sites within a 3-mile radius. Every guest room features a 32 flat-screen TV and large workspace. Rest peacefully with plush Marriott bedding, soundproof windows and blackout curtains. Vacationing families appreciate the quick 20-minute drive to nearby SeaWorld, Six Flags Fiesta Texas and STAR Soccer Complex. Why hassle with downtown traffic when you could stay at Fairfield Inn San Antonio Airport hotel with free perks and rates typically lower than downtown options? Our San Antonio Airport hotel serves a free hot breakfast buffet each morning complete with hot coffee, scrambled eggs, Belgian waffles, Dannon yogurts, assorted cereals & much more! - Yellow Rose Carriage Co.